The international conference "High Energy Phenomena in Massive Stars" was organized by the University of Jaén, in Spain, as part of its celebration of the International Year of Astronomy. The meeting hosted 51 participants from 12 countries who presented and discussed a wide range of observational and theoretical results specific to the exciting and fast-evolving field of massive stars. The conference focused on the following topics: (1) particle acceleration in massive stars; (2) gamma-ray production mechanisms in massive binaries with a compact companion; (3) the stellar wind connection and feedback effects; (4) gamma-rays in massive star-forming regions; (5) non-thermal radio emission in massive gamma-ray emitting stars; (6) gamma-rays from isolated and binary massive stars without compact object; (7) other relevant aspects of massive stars; (8) the new generation of gamma-ray telescopes and future perspectives for massive stars. 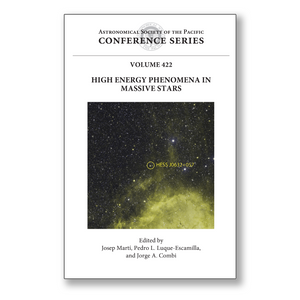 This volume contains six invited reviews, seven invited oral contributions, fourteen oral contributions and four poster contributions that will be of interest to high-energy astrophysicists and researchers desiring to understand the most extreme energetic phenomena that massive stars can generate, both as isolated stars and in binary systems.